.. not only diabetics can benefit from the healing effects of this delicious and healthy fruit .. Blueberries are the antidote to a long list of health problems, regenerate and rejuvenate our bodies are a true treasure of our forests ..
Vaccinium myrtillus not need lengthy introduction, its fruits for us without a doubt among the most popular fruits in the wild. Cranberry blueberry bushes mostly in coniferous forests, where it often forms massive growths carpet. Blueberries, dark blue berries ripen in June and July, now is the right time to go into the forest and bring home the greatest supply of concentrated elixir of health. What are the active ingredients found in blueberries? Blueberries are an important medicinal food for many centuries. Are known mainly by its richness in vitamin C, which strengthens our immune system and helps to prevent and cure diseases, colds and other infectious diseases. Blueberries are also one of the best natural sources of powerful antioxidants (carotene, anthocyanins, Pterostilbene), tannins (tannic acid) and also have a high content of iron and other bioactive substances. This cocktail of highly efficient and healthy substances makes blueberries literally 'superfoods', with the additional attribute Bio, with a wide range of positive and healing effects on our bodies. Unusually high content of antioxidants (including vitamin C) acts in our body as a shield against free radicals, viruses and bacteria. Blueberries are excellent thus preventing many diseases, drug and powerful tool in supporting recovery, protects our mucosa and stimulate their regeneration. Fresh, dried, frozen or otherwise preserved blueberries are the perfect remedy for all respiratory diseases, help treat the flu, tonsillitis, bronchitis, colds and other infectious and inflammatory diseases of the mucous membranes. Another fantastic effect is the ability to improve and maintain our vision, as demonstrated by scientific and professional research. Their frequent use is effective prevention of night blindness, people who have problems with night vision, to observe improvement in vision in low light conditions. Blueberries have for many generations used as a therapeutic agent for intestinal problems and colic and diarrhea and food poisoning, here working as an antiseptic and so-called 'stop'. Even in this case acts in any form, both fresh and preserved. Also have a beneficial effect on the kidneys and urinary tract, cleans them and help treat any infection in this area. A mild diuretic, relieves the body of harmful pollutants and improve the function of the lymphatic system. Also have a salutary effect on the prostate, talk about them even as a natural prostate cancer prevention, but also in relation to the prevention of many other types of cancer. Expert research has demonstrated a beneficial effect on the health of diabetics blueberries, and in several respects. Ingredients lower blood sugar and cholesterol levels. People with diabetes often have eye problems, especially in old age, and here they can blueberries serve as a natural remedy for maintaining good vision. Anti-inflammatory effects and high levels of antioxidants to help protect the mucous membranes, frequent area of health problems associated with diabetes. The combination of ingredients also strengthens the cardiovascular system and improves blood circulation and blood flow to the extremities, another common health problem people suffering from diabetes. In diabetic patients, of course, best blueberry consumption without adding sugar, or a suitable alternative sweeteners. Leaves cranberries blueberries have very similar effects as fruit. We harvest is early summer and dried for later use. Tea from the leaves is suitable both intestinal and stomach problems (see above), and to a slight lowering of cholesterol and blood sugar levels. It also has a beneficial effect on the kidneys and urinary system, which cleans and disinfects and helps with drainage in excessive water retention in the body. The external application relieves psoriasis and skin diseases. Recipe for infusion / tea blueberry leaves: 2 teaspoons of dried leaves, pour 250 ml of boiling water and let stand for 10 minutes, pour off the screen and sip throughout the day. How to properly store, buy and handle blueberries? Blueberries are the fruit intended for rapid consumption, picked by the store in the refrigerator for no more than two days, for longer storage, soften and are susceptible to mold. Before eating or treatment is always thoroughly rinse with water. If you buy blueberries at the store or at a street vendor, always verify if they are too soft, silvery bloom fruit also is a sign of their freshness. As we have already mentioned above, blueberries can be processed in many ways. Fresh is we consume either alone or as a žahour - mashed with sugar and cream, traditionally are also popular for dumplings or pancakes, fits into fruit cocktails, salads, or a refreshing ice cream sundae. Outstanding are the blueberry marmalade and jams, which can then be a healthy breakfast for the entire following year. 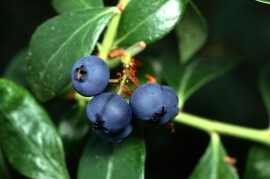 Blueberries can also handle the syrups or fruit wine, suitable for freezing and can be too dry. Very popular with us and enjoy pastries and cakes with blueberries, can be combined with other fruit, cottage cheese, yogurt, nuts and so on. In each region will certainly find a proven formula for their use in the kitchen. Blueberries are definitely one of the biologically most valuable gifts of our forests are unmistakable taste fruit and also the right injection rejuvenating energy.